Calling all creatives! Compete in Rummage ReDux Challenge! We invite you to take part in one of our favorite local events – but know prize money is taxable income! For more information on taxation of prize money, click here. As part of the City of Iowa City’s longstanding Rummage in the Ramp resale event – the City is offering an opportunity to “redo” a donated item and win some cash too! The Rummage ReDux Challenge is an opportunity to transform used items found at Rummage in the Ramp from serviceable to spectacular, all while competing for a top prize of $300. Rummage in the Ramp is a reuse sale organized by the City of Iowa City and staffed by local non-profit groups. This annual event helps divert tons of items from the landfill, with proceeds benefiting groups that volunteer their time to help. The 2017 event is scheduled for Wednesday, July 26 through Thursday, Aug 3, 2017 at the Chauncey Swan Parking ramp, 415 E Washington Street, located across from City Hall. Showcase your project at the Rummage ReDux Challenge event on Wed., Aug. 2 at 5:30 p.m. Judges will evaluate projects based on: imaginative reuse and overall improvement, quality of work, ability to be completed affordably and within a reasonable time period, and presentation and thoroughness of the storyboard. First, second and third place will all take home cash prizes. For more information about the Rummage ReDux Challenge, contact Public Art Program Coordinator Marcia Bollinger at 319-356-5237 or Marcia-Bollinger@iowa-city.org. 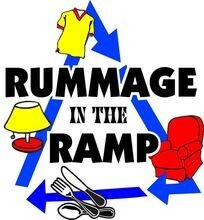 To learn more about Rummage in the Ramp, and to see the 2017 event schedule visit icgov.org/rummageintheramp. Contact Brooke 319.239.9903 or email is best. Hence why documenting Itemized Deductions (emphasis on charitable contributions) is critical! The pilot will involve between 4,000 and 5,000 taxpayers already selected for audits of itemized deductions on Schedule A of their income tax returns. The taxpayers will receive a notification (Pub 5254) inviting them to participate, and if they decide to do so, they will register and communicate with the Internal Revenue Service through a secure online portal. Taxpayers and tax professionals will need to authenticate their identities via IRS eAuthentication to access the portal, and will then receive notification to their registered e-mail address telling them to log into the TDC secure portal to view messages. Taxpayers will be able to upload documents or receipts, and respond to IRS questions in the portal. If you receive a call from a taxpayer pertaining to this program, assure the caller that it is a legitimate IRS program and refer them to the insert (Pub 5254) included with their notification of examination. At this time, only those taxpayers who received the Publication in the mail may participate. I often get asked for national averages and current information is hard to find because 2013 is deemed to be current. In Murphy v IRS, No. 05-5139 (D.C Cir 8/22/06) an award of damages for mental anguish was held tax free, but reversed on appeal. Therefore awards for mental anguish, emotional distress or loss of reputation are taxable. IDOR Changing Process to Prevent Identity Theft & We Are Too! The refund may take longer. Iowa Department of Revenue (IDOR or IDR) is committed to combating identity theft and tax refund fraud. We have robust fraud engines built into our processing systems and we are dedicating more time to verifying the validity of tax refund claims before issuing refunds. The extra time taken helps ensure the right person gets the right refund and criminals don’t pocket Iowa taxpayers’ money. The taxpayer may get correspondence from IDR. Part of the verification process may require an examiner to reach out to the taxpayer. If you do receive correspondence, contact the examiner listed as soon as possible to expedite the process. Earned Income Tax Credits (EITC) refunds will not be paid until early March. Beginning in 2017, a new federal law requires the IRS to hold refunds on tax returns claiming the Earned Income Tax Credit (EITC) until mid-February. This change helps ensure that taxpayers get the refund they are owed by giving the IRS more time to help detect and prevent fraud. IDR will also take time to apply its own fraud checks to EITC refund claims. As a result, it will likely be the beginning of March before EITC refunds are issued. Taxpayer’s can help themselves by providing a driver’s license number. Most electronic tax software has an optional field for driver’s license number. Providing that information as part of the return will expedite our verification process. This option is not available for paper returns. bmp, CPA will require all clients to provide a valid driver’s license number to help expedite the IDOR verification process. These sites, also known as crowd funding, provide a way for an individual or group to raise funds for business or personal purposes through a website that acts as a middleman. The website accepts donations through credit cards, takes their fee, and then distributes cash to the individual. The link to the site is often shared via other social media such as Facebook and occasionally even gets conventional press. In 2013 crowdfunding sites raised $5.1 BILLION per an industry report. GoFundMe is a website that allows people to list a ‘needed’ cause and request contributions from others throughout the world. Common requests include illness and accident victims, but also other ‘needs.’ In addition to the 5% that GoFundMe deducts from each transaction, WePay collects 2.9% and 30 cents from each GoFundMe transaction. GoFundMe address tax situations directly on their website by stating that no contribution deduction is allowed because the amounts are personal gifts and charitable contributions may not be deducted when paid to an individual. This determination leads to the other side of the gift: the recipient, and GoFundMe’s position is also that the recipient receives tax free gifts from individuals, not payment for work, product or services. The website does offer a Certified Charity Campaign which sends the funds directly to a registered nonprofit, which would appear to be deductible. If the recipient of the funds receives more than $20,000 they will receive a 1099-K from the site. The professional tax industry agrees with GoFundMe tax position discussed above and would report that amount on Line 21 of Form 1040, then deduct the same amount as non-taxable fits received and attached an explanation that it was personal gifts from individuals funded through the GoFundMe website. All we can do is all we can do, but maybe, all we can do is enough. Break from the Norm – Me. Right now I have another responsibility that is worth saving – her name is Lady M. She’s a purebred Australia Shepherd foster dog. She’s beautiful inside and out. Life isn’t the same without a good foster dog! Keys/Phone/Laptop – Madi and I love road trips and I can work anywhere when I choose too so phone and laptop are critical. Plus my best friend lives in Wisconsin so I have to be able to communicate with her! A little black stand that belonged to my grandpa’s mom. I remember the day he told me the story of how important that stand was to his mom and how it rotated rooms as he grew up. A brown tri level stand that was my mom and dad’s first night stand. The same stand that the baby monitor sat on when I was brought home from the hospital. What’s on your must save list? PS — no need to include tax returns on your list; I always have electronic access to those!